movement of cottonzsed and cottonseed uprod from lightly infested areas. cottonseed shall be either fumigated, given other approved treatment.. or destroyed by burning. Such cottonseed and products thereof which are subject to 301.52 J/ may be moved from such lightly infested counties under certificate as follows:(1) Such cottonseed that has been given approved heat treatment or approved fumigation, such linters and cottonseed hulls that have been given approved treatment, and such cottonseed meal and cake, which have been segregated from untreated cottonseed and cottonseed products and kept free from any other source of contamination, may be certified and moved to any destination. Producing state,-or to approved cellulose plants at any location. (3) All cottonseed hulls produced from the untreated cottonseed may be certified and moved for consumption or utilization to any destination within the regulated areas of New Mexico, Oklahoma, or Texs, or to any noncotton producing state. heat treatment prescribed in paragraph (a) or any alternate treatment that is administratively authorized under 301-52-12. 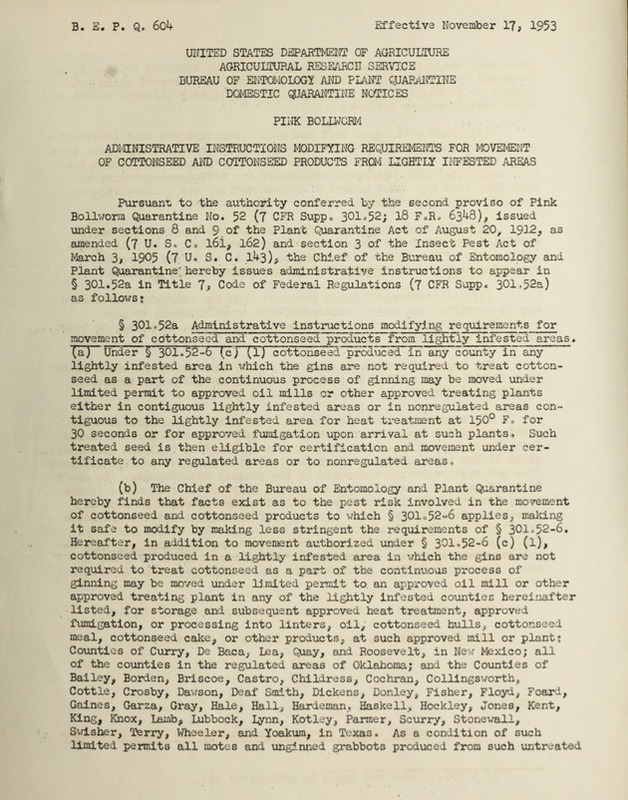 The purpose of these instructions is to make less stringent the requirements for movement of certain cottonseed and cottonseed products from the lightly infested areas described in the Pink Bollworm Qurantinep since it has been determined-that the pest risk involved in such mvmn does not require the continuation of the present requirements. In order to be of maximum benefit to producers and shippers of cottonseed in the areas involved., the instructions should be made effective as soon as possible. Accordingly, under section 4+ of the Administrative Procedure Act (5 U.S-C. 1003) it is found upon good cause that notice and other public procedure concerning these instructions are impracticable and unnecessary and since the instructions relieve restrictions they may be made effective less than 30 days after publication hereof in the Federal Register. Done at Washington, D. C., this 2d day of November., 1953. S301.52 does not apply to cottonseed oil.